Part 4 will be finished… as soon as it is humanly possible…. When I opened my eyes, what I saw was a dirty ceiling. It seems that I lost consciousness during the treatment. The cause for it must be the mana exhaustion. The dizziness, as if the whole world is spinning around, and the dazzling white world that I saw in my last moments were scary. I need to be more careful from now on. I slowly got up and stretched my body. Uhm… There is nothing wrong with my body. For now, my stomach is very hungry. I even have confidence that I can eat an extra large serving from the school cafeteria. What should I do if the mana doesn’t recover? I need to properly check my status, right? Thank goodness. It has been fully recovered. Sleeping at the inn will recover everything. Thank you my Game’s Brain. Hm? Hasn’t my max MP slightly increased? It must be because I have been using my magic nonstop during these past three days, right? There is also the possibility of my max MP increasing due to level up. Though, it might be because I kept using it up to exhaustion. If this is true, then I don’t like it. Since I don’t want to see that white world anymore. If this is true, then I will put an end to it right now. But you know, this might be surprising for me to say. However, it has been three days already since I first came to this world. Today is the fourth day. I think that I will stay in this world for a lot longer. How can I be so dense? I will need to say farewell to the slow life for awhile. I got down from the bed and exited the room. The villager-san then brought out my meal. It is a simple meal, but I am really thankful for a warm meal. Thank goodness that this is a world with delicious foods. After eating the meal, I was thinking about going to outside a bit to see how things were going on, when Cyan-san visited. Drying up completely? Uee… What’s that? How scary. Whoaa, Cyan-san is awfully angry. His speech is calm and isn’t that intense in tone and words. Even so, how can it be this impactful? That’s right. The 『Arms』 inside that black mist. The moment they disappeared inside that mist, they became dried up. Perhaps, mana exhaustion might be like that? But if they exhausted mana like that, then does that mean that the magicians who performed the summoning are no longer alive? I don’t want to die like a mummy. Anyway, Cyan-san’s scolding is just like a school teacher. No… It’s rather, like a mother. Yes. From now on, I will call Cyan-san Mother(Okaa-san). Since if I called him like that directly to him, he might look at me coldly, I will just stealthily call him that inside my heart. When I was thinking this, Cyan-san sent a really cold look to me. Gulp. Is he, an esper? That’s right. Since I can see the MP, I could assess and calculate my mana usage to just barely above the limits and avoid mana exhaustion, but when I thought about it again right now, it is really a dangerous situation. After all, I didn’t know that I could die if all my mana was used up, you see. ……That’s right. Everyone ought to act according to their respective role. But even though I am supposed to be a Healer in this place, I crossed the limits and fainted, and in the end, caused trouble for other people. Since it’s my occupation, I must know my limits and precisely stop before reaching it. Even if I didn’t do any healing that time, it will be alright if I heal them after sleeping for one day and recovering my entire mana. Furthermore, Cyan-san and Van-san had said 「We swore to protect you with our lives.」 Even so, if I ended up dying, then it will make them break their promise. Uwaaa, I am the worst. Even though I had been thinking that the me who was working hard was cool. Anyway, from now on, I will properly pay attention at the remaining MP quantity. If I use the MP to the limit, then I might die if monsters attack me after all. I will retain about 100 MP as much as possible at all times, and even if there are a lot of injured people like yesterday, I will absolutely stop when I become light headed. So that someone could live, I need to let someone else die. Cyan-san’s words are painful. Eh? Isn’t this a Fantasy Kingdom? Shouldn’t Another World be more enjoyable? Shouldn’t it be using cheats to work, creating a reverse H, earning income with modern’s knowledge, and having a fun life? This is wrong. This is, after all, reality. There are people living in this world normally. Since I am in this world, this is the reality. Then, this is also a place where death is always around the corner than the peaceful Japan. If for example, there are two people being poisoned, and my mana is only enough to detoxify a single person. I will have to save one person, and let the other die. If it is between an unknown person and Cyan-san, then I will help Cyan-san without any hesitation. After all, I am an egotistical person. I want to help people that I know rather than unknown people. I want to help people that I care about rather than a person that I barely know. Then, what if it is between Cyan-san and Van-san? Which one will I save, which one will I let die? This is impossible. Impossible, really impossible. I can’t choose either one. Th-then, what if it is between Cyan-san and a really important person like the Prince? Everyone will be obliged to save the Prince? Can I let Cyan-san die? No, I don’t want this either. I couldn’t do this. But even in such a situation, I must not use magic by exchanging my own life force. I need to prepare a sufficient amount of Ethers. I need to put a lot of them into my Item Box. Then I won’t need to fear that kind of situation. 『Black Healer』. This title is more, really more, heavier than I thought it was. Oh God, can I ask for this title to be changed? When I went outside, Van-san was already standing there. I thought that I needed to apologize properly to Van-san and bowed my head down while saying 「I am sorry for making you worry.」, then I got my head poked. Huuuurts…. It was so strong that it was as if my neck was bending backward. Knights are too strong, mou. I glared with teary eyes at him while rubbing my forehead with both of my hands and then Van-san made a crumpled smile while patting my head with his hand. Damn, isn’t this cool? Doesn’t this head patting make my mood rise? This is right on the spot for a dejected heart. This is just like 「The number one action that you want to receive from an Older Brother Character」, a 100 points perfect full mark action that is. Inside my heart, Van-san is gradually becoming more and more like an Onii-chan, while Cyan-san is Mother(Okaa-san). His Highness? His Highness is the honorary title for a member of the Royalty, right? So, someone that important also participated in this subjugation. Whoa, could it be that sparkling blondie guy? That Prince-like person? So he is a real Prince. This is bad. I had displayed too much power in front of a really influential person like the Prince. It is the standard in another world genre that the protagonist 「Doesn’t get close with the Royals」, if they do this then the protagonist will end up being used. So there are wars. I don’t like this…… That’s right, Van-san and the others are Knights, so in a war, they will kill people from the enemy nation. Surely enough, they had killed a lot of people, right? Not against monsters, but battling fellow humans. Van-san opened the door to let me pass. What a gentleman, or so I thought. Eh? Van-san won’t enter? Even though I will be talking with such an important person? What will happen if I make a mistake? Won’t I be punished for being impolite? 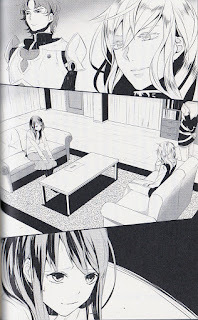 I looked up to Van-san with eyes that transmitted these questions, but he heartlessly closed the door. When I entered the room, the sparkling Prince from yesterday was there. He had taken his armor off and was wearing clothes that made the Prince resembles the classic-Prince-template even more similar at full speed. A white blouse without any decorations and a long vest-like tunic, fastened not by a belt but with something like a sash on his waist. Which reminds me, Jin-san also wore a long vest, so perhaps this kind of attire is the norm in this place. He is over 100 years old. He is sparkling and yet his title is so gallant. Even though his appearance is completely like the Prince who comes out from a shoujo manga. This person might be a con artist. I must not be deceived by his sparkling Prince-like outer appearance. Then, there was one other person, the one who gave the order to move out. He stood beside the sofa where the Sparkly was sitting. He might be acting as the Prince’s bodyguard. I tried to see his status. His name is Luke Briar, 128 years old. The commander-san of Blue Knight Order. His skill is 「Steel Armor」, his title is 『Gale of Steel』 too. This person has 999 HP. Perhaps it has reached the counter stop? Then does this mean that the human’s stat limit is 999? It’s here! If this keeps going, I am in danger of being involved in his affairs. If I am employed in the Knight Order, then I will be recruited for war. It’s rather fine if it’s to battle monsters, but I absolutely don’t want to go to a place with human opponents. I am, after all, a person who will eventually return home. So I must not be too deeply tied down by something like a country or the likes. Even more, not long ago, I had experienced personally how harsh the occupation of a Healer could be. If I become an adventurer, then I can go to many places. To investigate things related to summoning magic, freedom to move is essential. Hmm, I think I need to accept these conditions. Since what I did yesterday was so conspicuous, if I refuse everything, then I might be confined. There is a risk for being involved. There is also a risk of being imprisoned if I run away. That’s why I want my position to have just a teenie-weenie distance between us. So that when I know how to return, I could make a prompt escape. A Healer in a Clinic is just like being a town’s doctor, right? It’s alright since the work burden doesn’t seems to be heavy as it’s only for two days. I understand, Sparkly. You have done a splendid job in pushing and pulling me. Although, are there seven days in a week? If a week is four days, then that means that I will be working for half a week. Uuun, I can’t ask. I can’t ask: how many days does a week have? Well, perhaps it will be the same as Japan. The Prince Sparkly smiled when he heard my answer, then he sent a look at the commander-san beside him. Commander-san brought a small box from a nearby table and handed it over to the Prince. The Prince took out something wrapped by a cloth from the box and unfolded it in front of me. There were three 500 yen sized gold coins placed on the cloth. Although I called them gold coins, but rather than gold, they were copper? It was reddish. A copper that has dull aluminum-like tinge. This was the first time that I have encountered money since I came to this world. Is it a gold coin? Copper coin? Uuuun, what should I do? It looks like gold, but it also looks like copper. 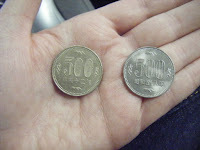 I remember that the value is usually copper coin → silver coin → gold coin, but which one is this? Hey, which one? Is money not an item? I also couldn’t see its status. Would it be alright for me to say my gratitude and take it? If these are gold coins, then the amount would be very high and very unlikely for a subjugation reward. They might find out that I didn’t know this. Then, wouldn’t it be better if I say that I don’t need it? Furthermore, if these are copper coins, then wouldn’t it be too few? Three coins of the lowest value wouldn’t even be enough to pay for a stay at an inn, right? They might have been just trying to test me. Or perhaps, there are other coins with lower values? Sparkly is really a con artist. This is just like a trick question. I need to answer it properly. Is it gold? Or copper? What to do? What to do, me? For now, let’s wager that these are gold coins. But, I unconsciously made an upward glance. Whoa, did it show on my face? Even the commander-san on the side made a comment. Gyaa. The Prince Sparkly exchanged looks with commander-san. I got found out. Has the fact that I don’t even know the common knowledge been found out? Even so, you Prince, even though you are Sparkly, why are you interrogating me. Are? Did they think that I lacked common knowledge due to being confined and mistreated by my family? That’s wrong! Father, mother and onii-chan. Everyone treasured me. Even though this is a grand misunderstanding, I couldn’t make any explanations. Even though they are my precious family, I don’t have any means to correct their understanding. Ah, no good. Tears. Falling down. No. Now I couldn’t say anything about my family except for praise. The door opened, then Van-san and Cyan-san entered the room. Eh? What is this? Did they hear? Are they really testing me? The Prince Sparkly spoke these words to me, while Van-san and Cyan-san, sat on both of my sides. Van-san put his hand on top of my head and patted me roughly. Oniichan, Sparkly is bullying me. He easily found my lie out. It’s my complete defeat. The fact that I don’t have the common knowledge of this world was easily found out. Or rather, it seems to have been found out from the beginning? I, who have been continuously nervous since they asked about my family yesterday, was crumbling apart in tears. However, thanks to this, my mood was a bit better. I had been under so much pressure by the Prince Sparkly’s scheming just now. Un, after I calmed down and tried to think about it, the situation wasn’t actually that bad, right? I can still perform a conversation’s orbital trajectory correction. About being a person from another world, about my ability to see Status, about the Item Box. As long as these three didn’t get mentioned, then it would be alright. For now, I need to make an explanation about why I was lacking in common knowledge. The first half is a lie, but the last half is the truth. Don’t know how to return home is 100% pure and want to return home is my unadulterated, most important wish. Even if my 「Want to go home」 was mixed with a lie, since this was the truth, it was filled with genuine emotions. So, it seems that everyone believed it. Means, hmm, even I want to know about this. That’s why I want to go to a place like a library to research summoning magic…… Ah, magic! Light bulb flash! Today, my head is so bright! I don’t think there are any books with spells in the Japanese language written on them, but this is an excuse so that I can search the magic books to examine things related to summoning magic. One way or another, they could comprehend my situation. I’ve been told that to enter the library I would need an identification paper, furthermore, to browse the magic books I would need a letter of introduction, these two will be prepared by Sparkly. Just like Sparkly’s proposal, I will work as Healer for two days and work as adventurer on the other days or go to the library when it’s open. Then ——— Prince Sparkly began his lecture about the common knowledge. So Prince Sparkly began to teach me the common basic knowledge. Un, even if you said it one at the time, I couldn’t remember it even for a bit. For the time being, the calendar seems to resemble Earth’s standard. Though, since every month is 30 days, the length of the year is different. Since I couldn’t memorize the names of the days, let’s write it on the memo when I go to the library next time. I also couldn’t memorize the names of the era, but I know that today is the 6th day of the 8th month. While saying this, Prince drew a simple map on a piece of paper. The rectangular paper now had a sunny side up egg like picture. Well, an oblong that closely resemble that of an to oval sunny side up egg that is. The egg yolk part is the Magic Race’s country. The Human countries are the white yolk part. Since there is a strong barrier surrounding the Magic Race’s country, one couldn’t enter. That’s why, on this slightly oblong donut shaped land, Humans battle and struggle with each other. Centered on the western part, one third of the white yolk, is Fantasma. On the lower eastern region of Fantasma is Güselbahn, the rest are one third from the north side to the east side and are governed by six countries of various sizes. “This is the Camiazure, where we are right now”, Prince pointed at a place located on eastern Fantasma, close to Güselbahn. Then, Coltea, which we will headed to next, is located a bit northwest. Un, now I know a gist of the location where I am currently. When I arrive at Coltea, I would like to see the real map at the library. Ah! I haven’t seen any letters of this world. What will I do if I can’t read them? After saying this, the Prince pointed at the money that he showed to me before. So it really did have a very high value, right? Rather than being called money, perhaps this is more like a raw material or antique goods? However, this is not an item. I couldn’t see their status after all. How vexing, as expected it was a loaded question. I should have said, 「I couldn’t take it」 with confidence. Well, it couldn’t be helped, the acting skill level was different. It is my complete defeat, you Sparkly. Even though you are a Template Prince, you are too scheming. Is it perhaps the matter of difference in age? Must be the age, right? Sparkly then took out a round 500 Yen-sized gold (this time, it really was a gold one) and round 100-yen sized gold coin, silver coin and copper coin one after another. 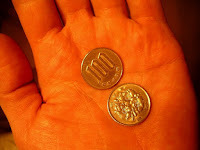 He then lined up the copper coin, silver coin, 100-yen sized gold coin and 500-yen sized gold coin in this order. A quarter of 100 right? This level is a piece of cake. Don’t underestimate Japan’s compulsory education. He was testing me again! It is a cliché standard that the ratio of gold, silver, and copper is 100. It’s good that it is simple. There are copper coins and silver coins and pieceling coins, then four pieceling coin become one gold coin. Un. Easy to remember. What is Kecha? Is it some kind of drink? Or perhaps a light snack? Cyan-san gave an additional explanation to me. I don’t know any Macas, but perhaps it is something similar to a fruit juice. If we assume that a silver coin is 10,000 yen, then a pieceling coin is 250,000 yen, while one gold coin is 1 million yen and an Orona gold coin is 10 million yen? Prince Sparkly then left the pieceling coin and put the rest of coins away. Eh? One round of subjugation is 250,000 yen? This is too much! This time I said it confidently. After all, it is implausible that every Knight who had risked themselves received 250,000 yen as their reward, right? It would be strange if I received more than they who had actually personally went to battle, right? Whoa, the words filled up with the intention to involve me. Even if he said that he was speaking honestly, I didn’t think that he was sincere. Nevertheless, I need to speak out. I am happy the help people near me. I am thankful for this. I like Van-san and Cyan-san. If it’s possible, I want to keep having a good relationship with them in the future. However, I don’t want to see the sight of people killing each other. I also don’t want to see the sight of Van-san and Cyan-san killing other people. Killing each other, not because of a grudge or any wrongdoing, but just because they come from different countries is something that I am absolutely opposed against. I understood that it couldn’t be helped if the people in this world did this. If they could expand their territory, then they could harvest a lot of resources and a larger population means that they can collect more tax. This is why I couldn’t say something like: Please stop waging war. It would be strange if I forced my own opinions on others. However, I don’t have any confidence that I could stand in the middle of the battle. A person in power like the Prince, would use any power in front of them, so surely he intended to ensnare me one way or another. But, I humbly want to excuse myself from being used as a tool for war. That’s why, before he gradually pushes his own way onto me, I need to speak out my own intentions. This person is a good person. He seriously cherishes this country. Then, even for a person without a clear background like me, he asked me to think for myself and then let me to tag along with them. He might have the confidence to overcome me. But no, it’s not that. Perhaps this is his way of being sincere. Maybe, statesmen are all like this. If a person like this is on the top, then the people of this country will be happy. I could understand why Van-san and Cyan-san devoted their swords. Sparkly-, no, that’s wrong, His Highness Leon, is a really great person. In the end, my acceptance or rejection of this money wouldn’t have any effect in the future. Then, I should accept it. I need the money, after all. While saying my gratitude, I received the pieceling coin and at the moment it entered my skirt pocket, it stored away into the Item Box. One 100-yen sized coin is 250,000 yen, you know! I am afraid that it could be lost if I just took it out into the open. By the way, afterwards, I tried to ask why the Prince brought something really valuable like the Orona gold coins. I see. He might be able to hide in a hidden stronghold or a few other places, but since there might be a need to run without any possessions, then he brought just the least things possible. Then, when I asked, what would have happened if I had accepted the Orona gold coins just like that? He made an absolutely, truly charming smile. Wh-what was he planning to do with me!? Next chapter. STILL A WALL OF TEXT OF INFO DUMP! Slow Life, read: https://en.wikipedia.org/wiki/Slow_movement_(culture). Basically Reene is referring to her former really-pleasant-full-of-modern-convenience lifestyle in Japan. Reverse Harem if you don’t get it. Dekopin, you know, the things that Itachi does to Sasuke in Naruto. Mou = interjection used to strengthen expression of an emotion (often exasperation). There isn't a proper way to translate it into english. Really or Geez, is almost close to meaning though. Keeping it since Yukkuri is lazy. レオンハルト・フォン・デュッセル・ファンテスマReonharuto Fon Dyusseru Fantesuma. I tried to Germanize the name as best as I can. Feel free to correct me. The Prince is using そなた (其方) to refer to Reene. This is an archaic lightly respectful second person pronoun. Hence: Thou, thee, thy and thine. About 26.5 mm in diameter. 紫魂暦 Shikonreki. Shi = Violet, Kon = Spirit, Reki = Calendar. Stound = Anglo-Saxon word for Hour. In Japanese RAW this is Koku刻, ancient time unit based on the Chinese Ke. The normal word for hour in modern Japanese is 時 (the 24 hours). In the story, 刻 is the local unit of time. Reene explain that 1 刻= 2 時. Hence, 1 Stound = 2 Hour. 光の日、闇の日、火の日、水の日、地の日、風の日、空間の日. I actually want to go German (Lichttag) or Old English (lēohtdæg), but since the Japanese is already using simple terminology, so I use the most normal way for the names of the days, also Spaceday’s space is the space in the concept of “3D space” not the “Outer Space”). 魔族Mazoku. Could also translated as Demon Race but in this case, I translate it as Magic Race, since the ma 魔in Mazoku also used in Mahou魔法magic. Fun fact: These Piecelings is actually “小粒金” (small sized gold) that is based on “Bu” (ichibuban), an old Japanese currency denomination. 4 Bu are equal to 1 Ryo, the main principal currency denomination in Edo Japan. マカ = Maca. By the way, there is a real world plant that also called Maca, that is Lepidium meyenii a root vegetable from Andes of Peru. They say its good for your fertility (IYWIM)… :P Not proven scientifically though. oh, this series is still being translated? i like it as much as "4 Billion lottery" and "A Realist's Kingdom Reform"
Though the picture you posted is different from the manga that is currently being translated which confused me for a moment. Oh no I feel the force of imminent death. Sparkling smiles are always a dangerous sign.